Nativus Sueciae Adiacentiumque Regnorum typus - Judocus Hondius Junior sculpsit et excudit. Anno 1613 - Hondius J., ca. 1630. Ur boken: "Upon the return of Bosnian to Holland in the be- ginning of September, without having effected his object, the public was greatly disappointed,and almost denied the strenuous efforts he had made to conquer all difficulties. It seems that after this bad success the Netherlands merchants gave up all trials towards the north-east. The English and Russians who afterwards con- tiued to seek for a passage in that direction did not meet with better success. In the year 1676 an English expeditionwas sent towards the north-east ; but the commander, Wood, only explored the edge of the ice between Spits- bergen and Novaya Zemlya, without rounding this latter island. Russian walrus-hunters and fishermen have also made many excursions in the seas around Novaya Zemlya. The greater part of the Russian expedi- tions were made with the object of reaching the Siberian rivers. Seldom did they go along the east coast northward of Matthew's Strait. In the Archiv fur WissenscluiftlicheKunde van Rusland, these excursions are described more or less completely. Chronologicalorder is adhered to, and this rather detailed account of the Russian expeditionsextends from the year 1690 down to the voyages of Liitke, Bixer,and Kriisenstern. One of the most remarkable recorded is that of"
Utveckling och resultat holländska nordliga och arktiska (höger klicka och öppna i nytt fönster). 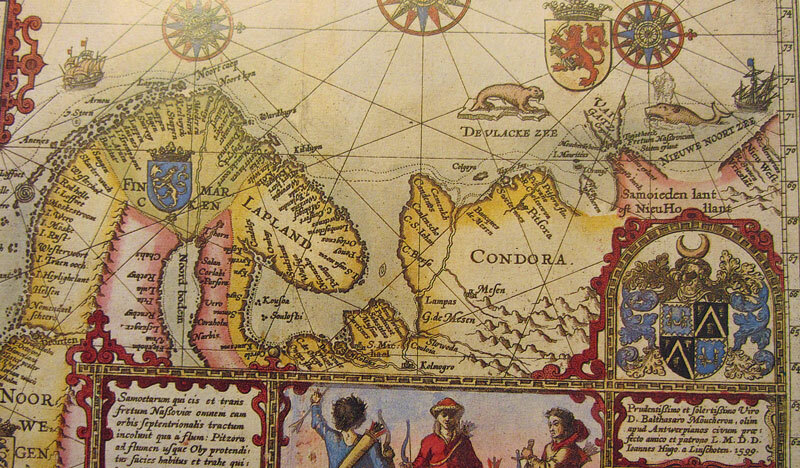 Kart over Skandinavia og Kvitsjø-området fra Van Linschotens atlas, utgaven 1601.